The curious thought of what life must be like as a royal must have crossed everybody’s minds at least once in their lifetime. While there has always been mass interest surrounding the British monarchy, we look at our own country and speak to princesses Tunku Dara Naquiah and Tunku Syazwan Kaiyisah, both born into the Negeri Sembilan and Pahang royal families respectively, for a look into what life is like as a royal. Back in 2013, Kiwi artiste Lorde released a song entitled Royals, and the chorus goes as such: “And we’ll never be royals, it [don’t] run in our blood.” The verse ends with a final, “Let me live that fantasy,” and frankly, that term alone best describes the ambience, or rather, the perception that has surrounded most royal families to ever be known to the public. Almost everybody dreams of becoming a royal, and watches with rose-tinted glasses at those who carry such titles, being given the royal treatment or taking the royal road in life. Stories surrounding royalty take the nation by storm and make quick headlines often (i.e. the Prince Harry and Meghan Markle wedding that hasn’t stopped trending, or the abdication of our Agong), and we can readily admit that the curiosity can never be satiated. Hence, we attempt to alleviate, or shed some light on the lives of Malaysian royals by first speaking to Tunku Dara Tunku Tan Sri Naquiah (or Tunku Dara for short) and Dato’ Indera Tunku Syazwan Kaiyisah Tunku Kamil Ikram, or Tunku Kaiyisah. An early family portrait, taken in 1967. Photo: Courtesy of Tunku Dara. As the daughter of Tuanku Ja’afar Tuanku Abdul Rahman, the tenth Yang di-Pertuan Agong, as well as the tenth Yang di-Pertuan Besar of Negeri Sembilan—therefore making him the longest serving ruler of 41 years—Tunku Dara is a real-life princess. She was born in the palace, as those days only allowed for a midwife. Her father, who served as a diplomat before he became a ruler travelled regularly to open missions, starting from New York, then London, Cairo and Nigeria. However, just before his posting to Japan, he was called back. “His brother, Tunku Munawir, who was the ninth Yang di-Pertuan Besar of Negeri Sembilan, passed away,” explained Tunku Dara, “and instead of giving the throne to the son who was under 18, they gave it to his younger brother. So, my father became the tenth Yang di-Pertuan Besar, and then the tenth Agong as well." The family in the early 60s. Photo: Courtesy of Tunku Dara. With the family in Egypt, 1963. His Royal Highness was the Malaysian Ambassador to the United Arab Republic. Photo: Courtesy of Tunku Dara. One occupational hazard of being a royal was the constant public scrutiny, and as the King’s daughter, Tunku Dara was under the spotlight. It was difficult back then, because she had wanted to work, and Tuanku Ja’afar was quite wary in the beginning. Eventually, she joined a British firm—having known about their traditions more—and for the sake of avoiding a local one at which she may hear statements such as, “Oh, she only joined us because she’s a ruler’s daughter” and whatnot. From there, she was invited to become the guest of honour at modelling shows, Miss Universe pageants and the like. Photo: Courtesy of Tunku Dara. Of course there are positive sides to living life as a princess too. She now teaches protocol and social etiquette to people, including current royals, as it is a subject she has had first-hand experience in—taught by her father who often advised her on royal behaviour and decorum. She revealed some of her tips such as how to properly enter a car (derriere in first, before lifting your legs into the car), which glass belongs to you in a seated banquet (always your right), which bread is yours (on the left), leaving your centre plate as is (as opposed to lifting your side plate onto it to munch on your bread), and how you should not cross your legs in front of royalty. Another fond memory was of how she had gone on to have tea with Queen Elizabeth herself. The family was invited into the queen’s private suite, and as they sat in the dining room, the butler poured the hot water into the teapot and left them to their own devices. The queen herself poured the tea, and had Tunku Dara pass it on. “Very simple food; sandwiches and banana cake. We had a lovely conversation, it was all very natural and unimprovised,” shared Tunku Dara. And although many people may think that the roles of royalty have depleted throughout the years and is steadily becoming irrelevant, Tunku Dara’s stance clearly contests this notion. Through her stature, she has successfully promoted the knowledge of protocol, social etiquette and the love of the English language to the masses—through her roles as president of KL Speakers Club, chairman of the English Speaking Union Malaysia, chair of finance and planning committee at Kolej Tuanku Ja’afar, plus being on their board of trustees and governors, and communications. Besides that, she also chairs the Tuanku Najihah Foundation, and runs a company under Syarikat Pesaka Antah. Business and royal affairs aside, you’d find Tunku Dara sharing similar interests with most of us, preferring to sing, dance, entertain and enjoy a plate of chee cheong fun, roti canai, yong tao foo and teh tarik over weekends! The respect for the monarchy isn’t so strong in the modern age, however, but I do think it’s a comforting and stabling thought. Shuffling to another royal family, many years after the reign of Tuanku Ja’afar, a princess was born in the royal Pahang household, to Tengku Puteri Seri Kemala Pahang Tengku Aishah Sultan Ahmad Shah, the daughter of the previous king, Sultan Ahmad Shah, and now sister to the current king, Sultan Abdullah Sultan Ahmad Shah, the 16th Yang di-Pertuan Agong. Or to keep it simple, this princess, Tunku Kaiyisah, is the current king’s niece. A modern-day princess. Tuanku Ja'afar, and Tunku Kaiyisah. Photo: Courtesy of Tunku Kaiyisah. She recalled the times her grandfather would make rounds at 9pm in the kampung areas, to see if there was anything that needed to be attended to. Being young, she thought she was just tagging along for the ride, but she realised as she grew older that it was in fact an act of duty by the king, which she felt very privileged to be part of. 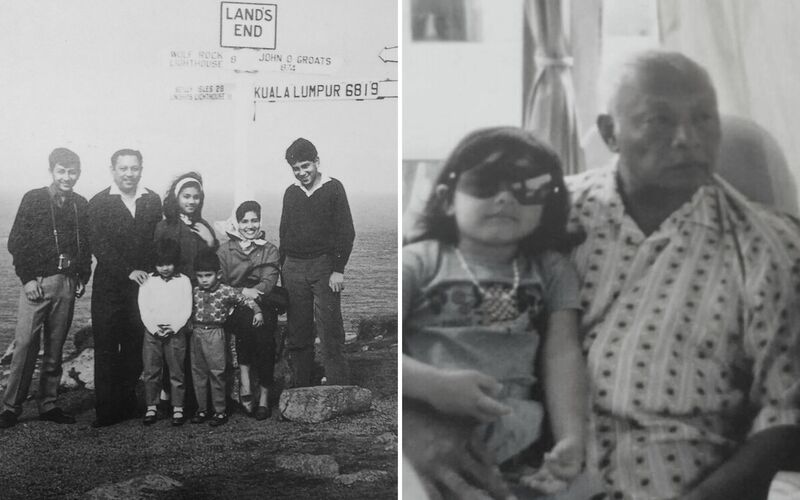 An old photo of Tunku Kaiyisah and her grandfather. Photo: Courtesy of Tunku Kaiyisah. Otherwise, Tunku Kaiyisah admitted to having grown up living a normal life and going through school smoothly, even though many would romanticise her princess title and relate it to Cinderella. Different images and misconceptions aside, and despite being a good student, the only qualm she had about growing up royal was that other kids would find something to make fun of. Considering she had good grades, was head girl and active in sports, she insisted that she was favoured because of her behaviour, and not because of her title. Nevertheless, other school students found something to pick on: her name. Tengku Puteri Seri Kemala Pahang Tengku Aishah Sultan Ahmad Shah and Tunku Kaiyisah. Photo: Courtesy of Tunku Kaiyisah. She, too, got the money talk from her mother; that money does not grow on trees and one must work for it. The PrettySuci co-founder admitted to never living too lavishly, but was privy to a lavish lifestyle such as what her grandfather had: going to the palace, travelling first class, getting special treatments and staying at five-star hotels. “But all these VIP treatments, you pay for it. Anybody who works hard enough can afford that lifestyle now,” she said truthfully. The only difference, she mentioned, was that some people see the importance of respecting a royal and extending them that accord as acknowledgement for their role in the country’s traditions, customs and heritage. These people too are the ones who invite her to officiate and attend ceremonies and events, which she said humbles her. She then divulged that the best part of being royal is being given the privilege to understand certain things in a better way, such as how the royal family was instrumental to independence, how other states work, being able to understand history better than just reading out of the books. Being given the privilege to learn customs and cultures, witness how things are done through charities and in kampungs, getting educated by other people’s livelihoods and then being able to go home to something slightly above average—it will always keep you on your toes. Photo: Courtesy of Tunku Kaiyisah. Which begs the question: does Tunku Kaiyisah feel that royals are irrelevant today? Evidently not. People do think that royals would be of help. The royals, she feels, are next to the people’s representatives. People express their concerns and grievances to them as a secondary channel, another part of the solution. “I know we don’t have a constituency to serve, but because we have this privilege of being part of royalty, it is our duty to give back to the people in any way we can. That’s what most of my family members are doing. They have all built their own Yayasan, or charity organisations, with which they help the needy and the poor,” she said. Naturally, despite the younger generation feeling that the royals are of no importance these days, Tunku Kaiyisah maintained that these are the rules that were set in place since before our independence, and which played a part even before our country became a nation and ultimately, to what it is today. “For as long as the country believes in culture and customs, the royals will never be irrelevant. We uphold the culture and customs of the yesteryears, and for as long as the country and the world appreciates history, we will always be there, because we are part of it,” she finished confidently. For as long as the country believes in culture and customs, the royals will never be irrelevant.